So while I was watching one of the latest episode of the show "Generation Tengoku" in which Yamapi is one of the MC hosts in the show, I found some pretty interesting topics that I wanted to also talk about on my blog. I actually quite like watching this show, the topics are always so interesting to watch. 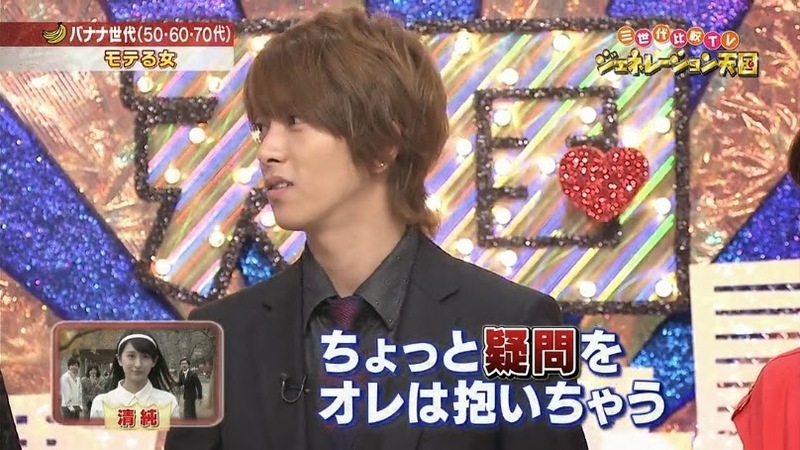 I think I would've still watched this show even if Yamapi wasn't in the show at all. For those who are not quite familiar with the show and have never heard of it or watched any of the episodes. Generation Tengoku is basically a Japanese variety TV show that talks about various trends and topics that are currently really popular in Japan at the moment. It cover topics such as makeup, fashion, health, beauty, food, music, dramas, anime, etc. Each episode focuses on a different topic that is currently "in trend" or that is really "popular" at the moment. They also invite panel guests on the show to discuss the topic for that episode and all the guests are split into 3 different age groups starting with banana generation (people born in the 50's-60's), kiwi generation (people born in the 70's) and mango generation (people born in the 80's and 90's...this is also where I belong! lol) They also do a top 10 best ranking on the topic and show what is most popular among in all the 3 different generations. It's a really great and interesting show. I'd highly recommend it to anyone to watch it who is not a Yamapi fan (which really Yamapi hardly gets any spotlight in the show. He's soooooo quiet and untalkative that he just fades in the background of the show, LOL!) but if you're interested in knowing what's currently popular and in trend in Japan right now then this is a must watch show for you so don't miss out! Especially if you plan on visiting Japan anytime soon, this show will let you know where to go and the best things to look out for while in Japan. Anyway, the latest episode I was watching did a top 10 best ranking for "popular things for women" that Japanese men like in women. And can you guess what was ranked #1? Girls with simple makeup! Yes, apparently believe it or not, the #1 thing that Japanese men find popular or like the most are girls with simple makeup. 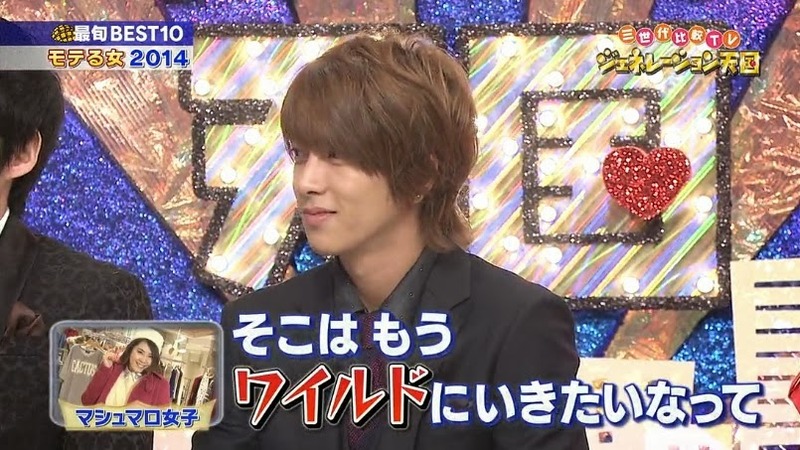 And of course, one of the host (Imada) goes and ask Yamapi for his opinion on this topic to which Yamapi responds with "It's not simple makeup that men like, it's no makeup!" and all the young female guests on the show react in shock like why?!?!?! Yamapi then explain that he likes girls who wear no makeup because it is more courageous and takes more courage to do so. It does take more courage to do so and I pretty much agree with Yamapi (even if I am a girl myself), I do think wearing no makeup is better than having a ton of makeup on. And it is true that most guys don't really mind girls who don't wear/have makeup on. It's just that we girls are always our own biggest self critic that we think we look absolutely horrible without makeup on that we should never show anyone with our no make face which is not true. I think I've already said this before on my blog but I don't wear any makeup at all on a daily basis. ZERO. Absolutely no makeup at all! The only times I do wear makeup is when I take pictures and outfit snaps and occasionally on those special days when I want to look a little pretty just so I can look somewhat presentable. Oh and on a day when I have to go for a job interview so I don't look like a dead zombie because as much as I hate to admit it, how you look also determines whether you get a job or not. We do live in a superficial world where everything is all about looks! But other than that, I generally don't like wearing makeup on a daily basis because I find it unnecessary and I'm totally comfortable with going out with just my bare naked face. It's no big deal, really. Maybe it's because I've been doing so for the past 20 something years of my life. I wish more girls would not be so afraid to do this. I mean I really don't want to become one of those girls who would even refuse to go out to eat or buy something at the grocery store without having any makeup on. Really, it's okay to show a little flaw and be yourself just for 15-30 minutes in your life. No one is perfect in this world. Yes, you might look a little tired with dull looking skin and dark circles showing, so what? WHO CARES! Nobody is going to point at you and pin out all your flaws. There isn't a need to look perfect and flawless every second and minute in your life. I mean I guess I can somewhat understand if you are a person with acne prone skin and you have pimples all over your face or if you have really dry skin that you need to wear makeup to cover it up. Otherwise if your skin is perfectly fine with no pimples, no dark spots, no freckles or any dryness at all, why do you need to wear makeup everyday? What is there to cover and hide? I guess I'm more lucky since I don't have any of the skin problems mentioned previously other than I do have a few moles and acne scars on my face. No I don't have perfect skin but I am not afraid to show my imperfections and flaws. Instead of using makeup to cover them up, I just leave them as it is. Because to me what's more important is having clear and smooth skin than to cake my skin with loads of makeup trying to cover my flaws. That is also why I spend much more money on buying skincare products than makeup. Also because I don't share the same love and passion for makeup as I do for fashion. So rather than spending so much money on makeup products to hide the imperfections, why not spend the money to buy skincare products to "fix" the imperfections? Because really when a person has good and clear skin to begin with, then there is no need to be afraid of showing your natural self and be more confident of who you really are. But I'm not trying to say that makeup is bad for you and that you should never wear makeup. While I do think makeup can help to enhance a woman's beauty and make them look beautiful, it is also important for a woman to feel comfortable in her own skin. To be able to look in the mirror everyday and tell yourself that you look beautiful just the way you are. And even though I do think the me with makeup on does make me look a whole lot prettier, I still find myself to love the me without any makeup on because it's the most "自我" (most true) self of me and who I am. No fake mask, no filters and no photoshop edited work...just me! And if you look as good as Kitagawa Keiko with no makeup on, why would you even need makeup to begin with? lol. But of course, not everyone has perfect flawless skin as Keiko does (she's just really lucky! ), but I'm just saying for those who already have beautiful skin to begin with but still think they look awful without makeup on is being too hard on themselves. This girl looks stunning even without makeup on. Keiko has so many scenes in the drama Buzzer Beat with no makeup on that I applaud her being so brave because not many actress would be as willing to show themselves on TV without makeup. Anyway, another rather interesting topic brought up in the show of Generation Tengoku that ranked pretty high for what was most popular for women among Japanese men was wearing all white as it gives out a very "清純" (pure and innocent) look to women. 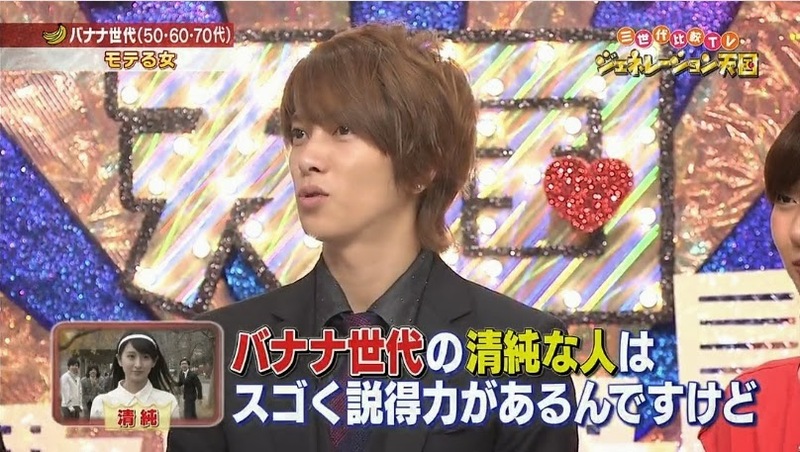 Yamapi also blurted out with another shocking response when he was asked what he thinks about this topic. Yamapi actually said while the people with this kind of "white pure innocence beauty" image from the banana generation makes it very persuasive to believe but it is also very questionable to him. He later explained how you'd often associate these type of girls to have a very "clean and neat" image but Yamapi isn't so certain of how true this would be as in today's world, everyone likes to play around and it really makes you wonder if such pure innocent beauty even exist anymore.